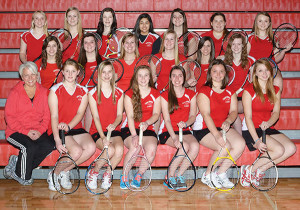 The Lady Red Hawks tennis team won the Sparta invitational by the score of Cedar Springs 13, Sparta 8, Fremont 5, and G.R. Union 2. In OK Bronze conference play, Cedar Springs won one over Greenville, tied with West Catholic, and lost to Forest Hills Eastern, Forest Hills Northern, and Northview. In regional competition, Cedar Springs had four players advance to the second round: #2 double Kellsie Rypma and Jordan Ackerman; #3 singles Katie Schumann; and #4 singles Rebecca Williams. 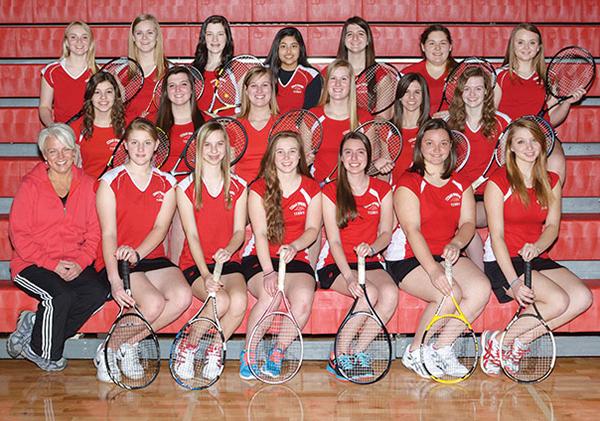 Competing in singles for the Red Hawks this year was #1 Shannon Leal; #2 Megan Brunett; #3 Katie Schumann; and #4 Rebecca Williams. Competing in doubles play was #1 Emma Schut and Julie Schut; #2 Kellsie Rypma and Jordan Ackerman; #3 Kat Scrivner and Jessica Brunett; and #4 Anna Behrenwald and Mariah Rios. The Red Hawks graduated two seniors this year, Shannon Leal and Megan Brunett.